Made tough, made to last. 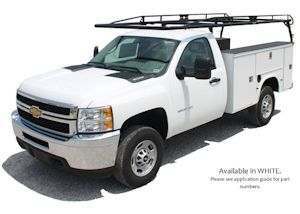 Kargo Master Pro-III Medium-Duty Truck Racks and Ladder Racks will meet and exceed your tough job demands, all while looking great on your truck. Do you plan on using your truck or van to lug around heavy equipment or long ladders? 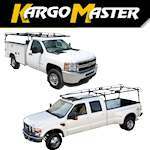 Contractor’s Solutions sells the exact Kargo Master truck and van racks that you need. 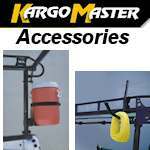 The Kargo Master brand is known for providing high quality racks and equipment that make your job easier. They use thicker steel tubes and carry a reputation as the strongest production racks available. 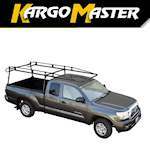 If you need a durable rack to carry heavy construction materials or a sturdy rack that can support long ladders, pipes, and lumber, Kargo Master truck and van racks are built for your specific use with both endurance and easy accessibility. 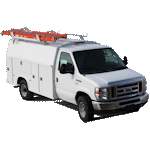 Kargo Master truck and van racks come in a wide variety to suit all your contracting needs. Kargo Master Pro II truck racks are built for heavy duty use when carrying large loads of equipment. The Pro II can also be specialized for pick-up trucks without shells. The Kargo Master Pro III ladder rack is recommended for slightly lighter, but longer loads, such as long ladders and PVC pipe. 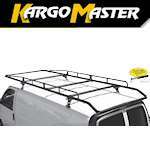 The Kargo Master Pro IV is an aluminum truck rack built for easy manipulation. It includes adjustable mounting plates, self-locking nuts for easy assembly, adjustable legs, and removable bars. The Pro IV can be modified to fit your needs perfectly. Kargo Master also manufactures drop-down van ladder racks which use a spring mechanism to raise and lower the ladder into position. Whatever your needs are for carrying equipment on the job, Kargo Master truck and van racks have you covered. Add a professional look to your truck or van by picking the rack that best works for you!